Serious coffee lovers are always looking for a new way to enhance the experience. I know from a personal standpoint, I have tried every type of coffee maker imaginable. Lately, I have centered on the stovetop espresso maker, but I’m always open to anything that might make my morning brew better. Perhaps it’s time to look past the method and focus on a different step: coffee roasting. If you are drowning in a sea of megabrew, it might be time to take your coffee game to the next level. 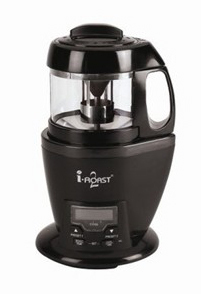 The i-Roast 2 Coffee Roaster is a home device capable of producing fresh roasted coffee beans right on your countertop. With features such as five stages and preset roasting curves, your coffee-roasting game can be off and running immediately. When you find your perfect roast, the machine can store it (along with nine other preferred roasts) in the on-board memory. The included timer and temperature gauge allow for consistent results. With a little experimentation, you can achieve quality results every time. Oh, and if you want to have ultimate precision with every cup of joe, check out some advanced tips and tricks, here.